To Christians, the veil of Death, that dark, impenetrable horizon that marks the end of the journey of all of our lives, is not a fearful boundary between the worlds of the living and of the dead. It isn’t the end. Yes, the dead do not return – yet, but there is nothing to fear – as Christians we know that our journey will require us to travel through the valley of the Shadow of Death during our lives, and then beyond – into the realm of death itself. But, Jesus has returned, has shown us that God’s love – the undying and uncompromising love of our Creator, the creator of all that is, including Time itself, is a love that is more than sufficient to pierce the veil that separates these two worlds. Halloween is a very ancient festival, known as Samhain by the Celts. It was the Festival of the Dead. Cattle were brought back from their summer pastures and livestock slaughtered for the winter. Bonfires and lanterns would be lit; and the spirits had to be propitiated so that the people and their livestock would survive the winter. Like most major feasts in ancient calendars, Samhain was a day of transition: in this case marking the end of the harvest season and the beginning of the season of darkness: a time of concern. In these ancient communities, which did not have the safety nets or resources we have now, a bad winter, or a bad harvest, or a delayed Spring, could be catastrophic. They knew something had to be done to calm supernatural anger. It was necessary to seek help from friendly spirits and from one’ ancestors who were already in that realm. 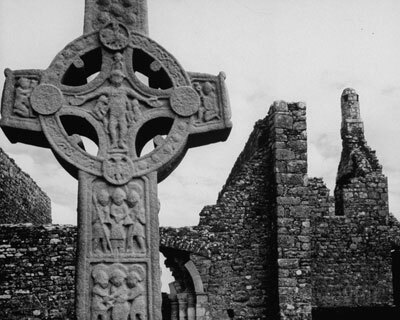 Many ancients, not just the Celts, believed that at this time of year the veil between this world and the next was at its thinnest, making it easier for us to communicate with those – the spirits of the dead and supernatural entities – who are part of that realm, but it also made it easier for them to trouble us if we didn’t treat them right! Halloween and All Saints Day both recall these beliefs, which have persisted for thousands of years, or more. All Saints Day was originally part of a three day Medieval Christian festival that began with All Hallows Eve (which we now know as Halloween); and ended with All Souls Day on Nov 2. 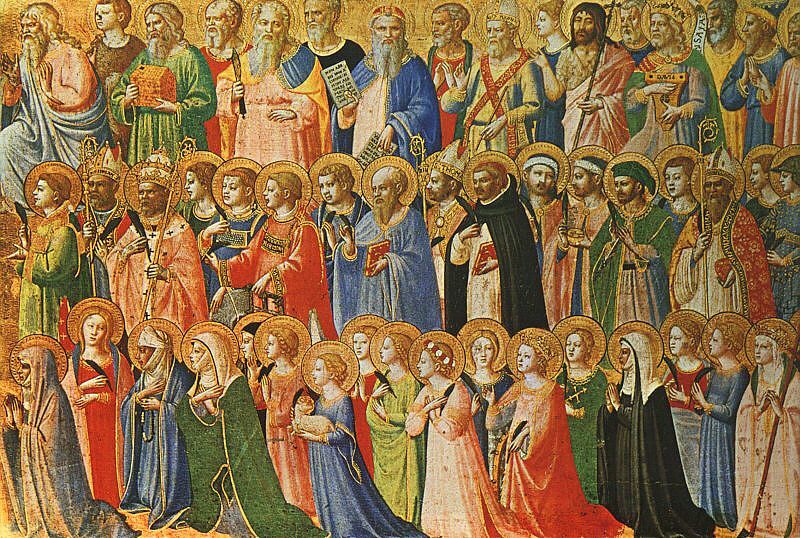 The Forerunners of Christ with Saints and Martyrs (about 1423-24) by Fra Angelico. All Saints Day was a joint celebration for all the Saints of the Church – since there were far too many to each have their own feast day, and All Souls Day was a day to remember the faithful who died in the previous year. Most Protestant Churches have either merged these three days into a one day celebration that recognizes all saints of the church – known and unknown (meaning us, when we pass, too); or else they ignore the Festival completely – like the old Calvanists did – disdaining the Holiday, as they did all Holidays, as being too “Popish” in nature. The tie that links Halloween, All Souls Day and All Saints Day together is the same ancient belief the Celts had, that the veil between this world and the next is thinnest at this time of year. It was a day very appropriate for seeking to calm our fears and uncertainties in this world by reaching out to the next, as the three days in the Medieval Christian Festival each did in their own ways. I want to reflect for a moment on my last sermon, given on October 4th, where I spoke on the concept of Belief. I pointed out that as Christians, we often think that “believing” is a goal – of having a firm, unshakeable commitment to the absolute truth of God. But, I argued that belief is actually a process – a journey with God, not a journey to God. Belief is not something we achieve, not a goal. Belief is something we do. We don’t know where Belief will take us in our journey through life, but we know where we’re going to end up. The point of this morning’s reading from The Revelation of John is similar: we’re not certain what road we’ll follow to get to the end, but that we’ll get to the end is certain. The seeds of the Kingdom of God always surprise us – often originating as what others see as a weed or a nuisance. And yet – they grow and grow and grow, and are unstoppable. … This is how our faith is: small beginnings that produce wonderful results we didn’t know could happen! This particular lesson looks at the Parable of the Mustard Seed, which is found (with only minor differences) in Matthew 13:31–32, Mark 4:30–32, and Luke 13:18–19. 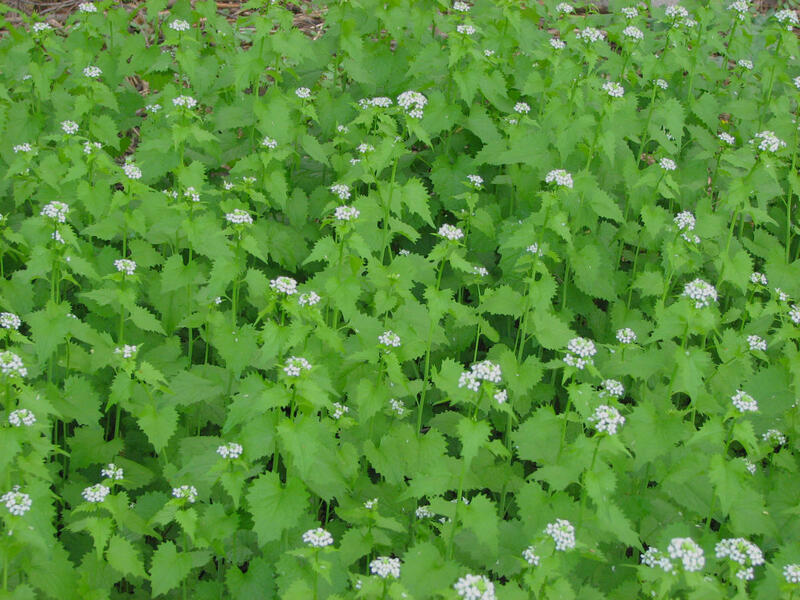 This lesson works best when presented at the time of the year (May or early June) when the “Garlic Mustard” plant – an invasive weed here in the U.S. – is in blossom. It is often widespread in the understory of forested areas, and can also be found growing in disturbed soils, including along the edges of roads, paths, fences, etc. Presented at First Baptist Church, Belmont, MA; June 17, 2012. How many of you are familiar with the Garlic Mustard plant? It’s a common weed in this area. If you crush its leaves, it smells like garlic; and it has a taste similar to that of mustard, hence it’s name. In colonial times it was a common herb, since the colonists had no money to buy spices from overseas, such as pepper, even if they had access to them. It was also very easy to grow. …Perhaps a bit too easy.